John Charnley, was considered by many to be the inventor of the the prosthetic hip. 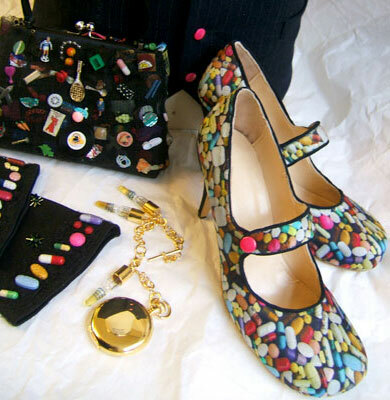 Pharmacopoeia were commissioned in 2005 by the John Charnley Trust to make a group of wearable pieces illustrating his research. To address mobility lost through joint pain and pain management, our five pieces—waistcoat, pocket watch, handbag, gloves and shoes—resonate with patients on an intuitive and emotional level. We make reference to what pain and stiffness stop you doing – like dancing, walking, going out to the shops, knitting, or playing the piano. The need to wear comfortable often unattractive shoes (no high heels any more) and having to use a walking stick. Medicines are included from the various classes of drug that are use to treat the pain of arthritis. The non steroidal anti-inflammatory drugs, paracetamol and the paracetamol/codeine drugs, the cytotoxic drugs methotrexate and gold injections. Phials of the latter were incorporated into a pocket watch and chain made by jeweler Holly Belsher. The waistcoat references John Charnley’s fabric infection charts which he made on pinstripe cloth.